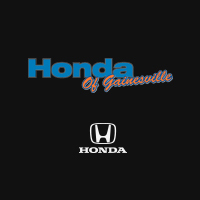 Honda of Gainesville offers great local deals on new Honda cars, trucks and SUVs. Our hassle-free car shopping experience is what makes us one of the top Honda dealerships serving the Ocala, Palatka, Gainesville and Lake City Communities. If you are looking for affordable new cars for sale, you have come to the right place. We offer top-quality new Honda cars, sedans, minivans and SUVs such as the Honda CR-V, Honda Accord, Honda Civic, Honda Odyssey, Honda Pilot and so much more. Our dealership is all about making dreams come true – our goal is to help you get behind the wheel of your dream car at a low cost. Our new vehicle showroom has the latest class-leading Honda models in the market. Be sure to browse through our Honda showroom to find your dream car. Can’t locate the car you’re looking for? Contact one of our new and used car sales experts, and we will help you find your dream car in no time. At Honda of Gainesville, we offer a fun car shopping experience that is transparent and honest. If you want to avoid the unnecessary complications that come with hidden fees, Honda of Gainesville located near Ocala, Palatka, and Lake City has what you need. Our team of auto financing experts will help you get affordable lease and finance offers, along with Honda incentives to help you save on your next purchase. Once you find the right Honda for you, fill out our online finance application to get auto financing assistance on a new Honda vehicle today.